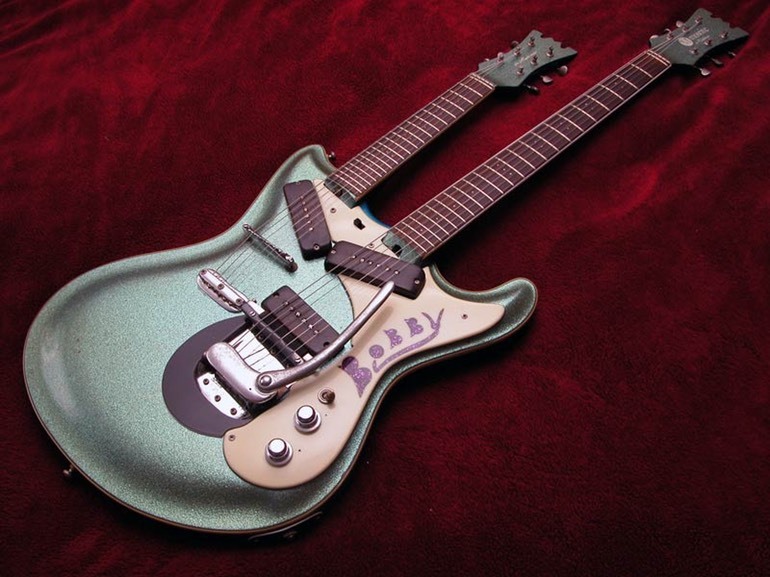 Damon Thomas was a little reserved when it comes to telling the full story of the early Mosrite 6/12 he had, named Bobby. Although it has nothing to do with Glen, I would like to share that guitar's very cool story to give some insight into Damon's character, along with some Semie Mosley and Mosrite history. Damon shared this story a couple of years ago. The first time I saw "Bobby" it was in pieces, and even though the electronics were not in it, my friend had it strung up. I fell in love with the thing. Great action with that zero fret, and a super fast neck. Eventually, it ended up in my possession. It sat for more than a decade. The main holdup was that the guitar was missing one of its pickups. I didn't want to put any old pickup in, it would have ruined the look. Eventually, I went to a local vintage guitar store and was given the name of the foremost Mosrite collector in the US, who lived just a few miles away. He dated it to 1963 and pointed out some of the unique and puzzling features. I joined a Mosrite group to share pictures of this very unique piece of American guitar history. Not long after sharing, a gentleman responded by saying his friend had this guitar stolen from him 50 years ago. It was stolen from the Church where he and Semie Moseley were playing a revival. The guitar was made for Robert McNinch. The guitar was a gift from Bob's father. He bought it directly from Semie for a discounted price as it was going to be dedicated to praise and worship music. The guitar was built in 1962, not in '63 as I had thought (more on this later) as a burst. Not long after, Bob joined brothers Semie and Andy Moseley, and (soon to become master builder) Bill Gruggett, as one of the first 4 employees of Mosrite Guitars. While working in the shop, he enlisted the help of Bill Gruggett and completely redid #003. Of the first 3, this was the only one with the binding around the body. 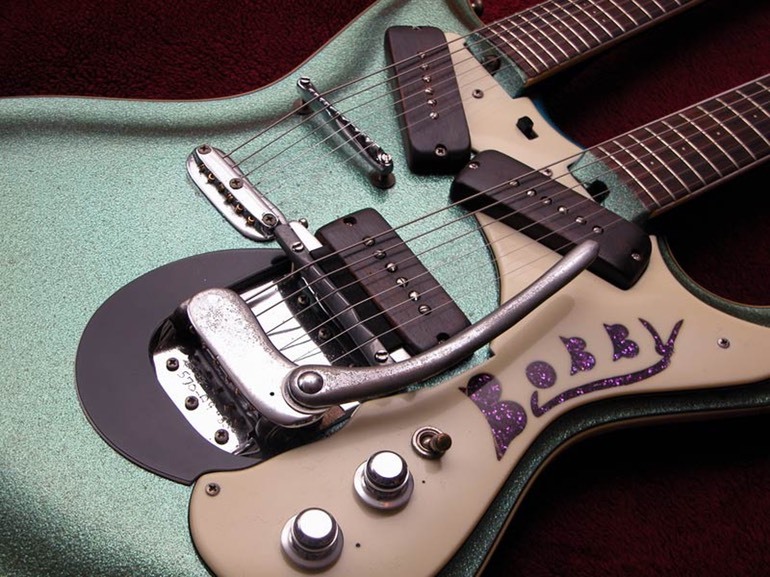 Bob used a drill bit to cut out "Bobby" on the pickguard, put tape on the back, then filled it with glitter and filled it with poly. He did the same to the missing original mistake plate but in the shape of a cross. At the time of the rebuild, they also replaced the pots. This is why I assumed it was built in '63. Bob told me that the great Joe Maphis peeled off $1000 in hundred dollar bills for the guitar so he could give it to Rose Lee, who had fallen in love with it. Even though Joe was a bit intimidating to the teenager, Bob still stuck to his guns and kept telling him "Thank you Mr. Maphis, but it's not for sale at any price." When it was stolen, it completely ruined Bob and he lost his enthusiasm and eventually decided to make his mark, in the service of our country, as a Marine. I just boxed it up. There's a big knot in my stomach, but my heart is warm with the thought of Bob seeing his guitar for the first time in 50 years. And he doesn't have to try to fix anything. She plays beautifully. I had one of the very earliest Joe Maphis Doublenecks that would eventually become the production model. I was told there were 3 built originally, here's #2. It is interesting to look at several of Glen's guitars to see how he re-positioned his pickups. It suggests, that Glen tinkered with the pickups to customize the sound he wanted. This picture shows a stock Mosrite Mark 1 Double Neck and Glen's. You can clearly see that Semie had shaped the base of the neck to accommodate the pickup's stock position, as seen in the right-hand photo. But then you have this earlier 6/12 where the neck has accommodated Glen's positioning of the pickup. Maybe Glen had played one of these before Semie made his and he replicated the pickup placement? That one could use a little dusting but never the less, it is awesome to see. At some point, Glen ended up with a Mosrite Ventures Model, double neck guitar. This guitar is almost identical to the Joe Maphis model produced prior to the Ventures pact. I think there is a chance that the Ventures may have given this guitar to Glen. 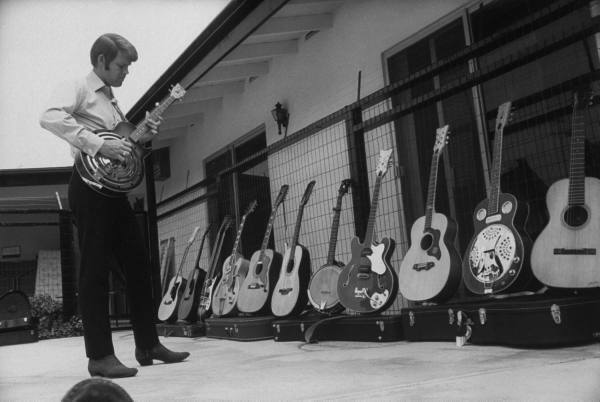 In the book, "Walk Don’t Run – The Story of the Ventures”, Don Wilson states “When Glen showed up at the studio, he played on five or six songs. He named his contribution Cookout Freakout on Lookout Mountain, but he didn’t play lead on anything. I think Bob and I gave him a Mosrite guitar.” Guitar Freakout was released in Feb of 67…so there is a possibility that the Ventures gave him the double neck (which was one of their models that they distributed), in 66, when they recorded the album. Glen’s Mosrite double neck is currently on display at the Musicians Hall of Fame and Museum, in Nashville, Tennessee. Joe Chambers, the owner and CEO of the HOF Museum, was nice enough to take the time to share some stories about Glen's exhibit there. Mr. Chambers stated that he purchased the double neck Mosrite from a Sherriff Howlett, who was in office in the county where True Grit was being filmed. He stated Sheriff Howlett became friends with Glen and John Wayne while they were filming in Colorado. Mr Chambers stated that Glen befriended the Sheriff and sent him quite a few personal items, that are also currently on display at the Musicians Hall of Fame. This picture was taken in 1968, at Glens LA home. The majority of the guitars in the picture are Mosrites. The 3rd one from the end is the double neck. It probably was not too long after this picture was taken, that Glen shipped the guitar to Sheriff Howlett in Colorado. Mr. Chambers shared that the double neck was sent to the Sheriff on a greyhound bus with the shipping label on the guitar case and no box. He stated that when he received the guitar and case at the HOF, the guitar case still had the original shipping sticker on it. Thanks to Dee for these pictures of Glens Mosrite double neck at the Musicians HOF.